It is hard to believe that the EU funded regional project SWIM-H2020 Support Mechanism is ending in a few days. It was an intense three years of working very close with the stakeholders in the Partner Countries in the South and East of the Mediterranean: Algeria, Egypt, Israel, Jordan, Lebanon, Morocco, Palestine and Tunisia. The Support Mechanism’s contribution to reduced marine pollution and the sustainable use of scarce water resources in numbers adds up to 1.408 participants in the Project’s Capacity Building Activities: 14 Regional and 51 National Trainings, 6 Study Tours, 20 National Consultations, 16 National Meetings, 10 Peer-to Peer Activities and 5 Webinars. At the Closing Meeting that took place in Brussels on the 8th of April, everyone involved expressed appreciation of the above efforts but most of the discussions were on the achieved results and impacts. A booklet summarizing this is available in English, French and Arabic, including some deduced Lessons Learned that will be useful not only to the follow-up 4-year project expected to launch in May (the Water and Environment Support (WES) mechanism), but also to other similar regional projects. Ms. Henrike Trautmann, Head of Unit-Regional Programmes Neighborhood South, DG NEAR, and Mr. Davor Percan, Head of Unit – Bilateral and Regional Environmental Cooperation, DG ENV, both attended the Closing Conference of the project, along with Mr. García-Herraiz Roobaert and Ms. Alessandra Sensi from the Secretariat of the Union for the Mediterranean, Ms. Tatjana Hema, Deputy Coordinator of the Mediterranean Action Plan of UN Environment, Ms. Galina Geogieva and Ms. Cécile Roddier-Quefelec from the European Environment Agency and many more. MIO-ECSDE was a key partner of the consortium, taking on several environment related tasks, responsibilities and deliverables. Sylvie Fontaine and Stefano Dotto of DG NEAR, as well as several other staff at the EU Delegations of the Partner Countries were amazingly supportive, as were the country Focal Points that were hounded by the project team on a daily basis but never complained and delivered results. 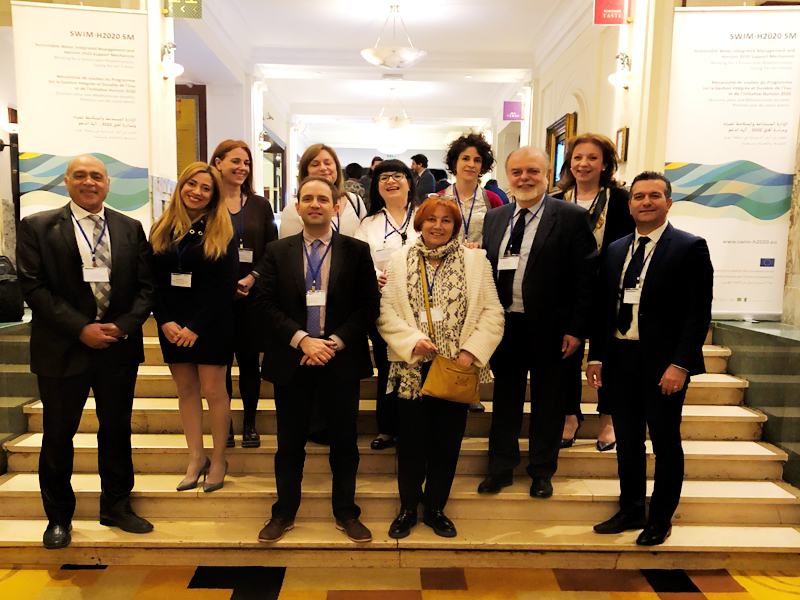 A big thanks also goes out to Dr. Emad Adly, Anis Ismail, Danai Amplianiti, Ghada Ahmadein, all part of the core MIO-ECSDE team, as well as to the Team Leader, Prof. Michael Scoullos that guided the process and tirelessly contributed to every aspect. All of the LDK team deserves a round of applause (Evie, Stavros, Eirini, Victoria, Chara, to name a few) along with the other consortium team members that provided the support mechanism that made SWIM-H2020 SM successful. A very pleased project team takes a breather for a photo to remember.